I only use corn free. I add Stabil. Where in NH did you find corn free? The only places I've seen it are Pease Tradeport and Haffner's. At Pease it's airplane fuel and ~$10 a gallon, Haffner's its 110 octane race fuel and close to $8 a gallon. Gasoline additive packages are added at the fuel depot or refinery depending on the brands. Ethanol is blended at the refinery. I doubt seriously that a independant small retailer is buying untreated transport loads of gasoline. Small retailer I would be more worried about contaminated fuel tanks and water. E10 (10% ethanol) gasoline has been mandatory in the US since 2011, E15 (15%) is being implemented this year. What is important to remember is the pump has a disclaimer stating the gasoline may contain ethanol. Lucas and Stabil are both good products. Used in the two-stroke V-6 and now the 4-Stroke V-8. Use it in my truck as well. Vapor technology protects engine and fuel system above and below the fuel line. Helps prevent Ethanol fuel-related damage in vehicles and small engines. Advance formula for engines used in water environments, to better remove the moisture. Helps prevent corrosion damage and helps remove water. 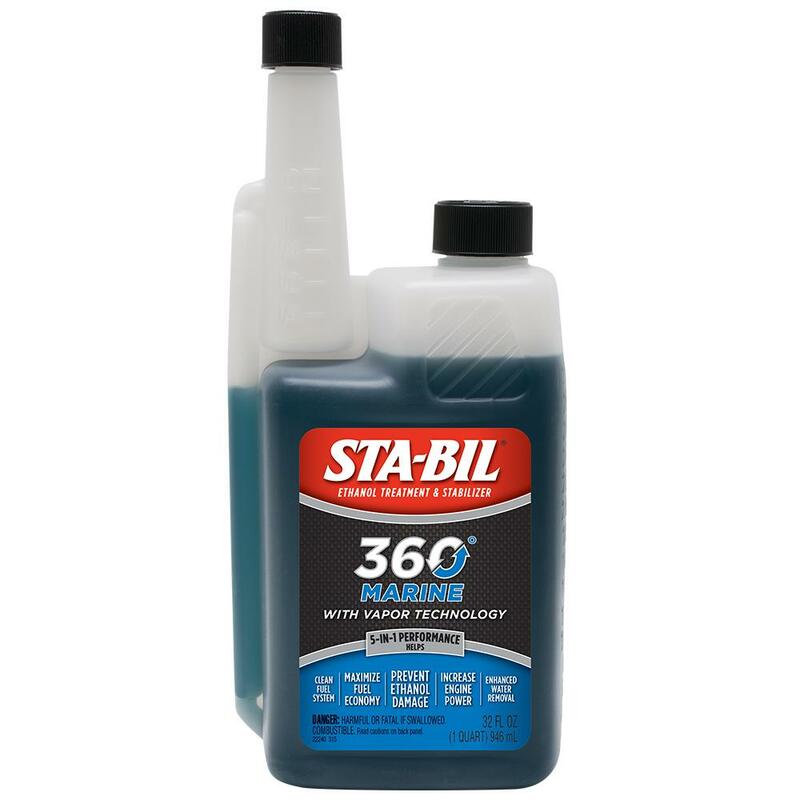 Helps clean the fuel system for improved in-season performance. Used in the two strove V-6 and now the 4-Stroke V-8. This is the same thing I use in my Pro XS, and my almost 40 year old 15hp Johnson tiller on my johnboat. I use Ethanol free gas 100% of the time but never hurts to be over cautious. Many people love Stabil and we've never had issues with it, but several mechanics recommended "seafoam". so we made the switch and havent looked back, i have a 94 merc 60hp and she runs amazing even with 300+ hours on it. I use this stuff too in my engine. Great stuff. @A-JayYou put 360 in your truck? Have you found any benefits from doing so? I've always thought about adding something since my truck can sit when I use my company vehicle a lot. Yes - I will say that I can not list any very obvious benefits from using the Sta-Bil 360 in my truck. But I've always used some type of gas treatment in every engine (large & small) ever since 'ethanol' became a thing. Once I got the boat - I bought a 'career supply' (several cases of 32 oz bottles) and rather than using two products to do the same thing - I just went with the Sta-Bil. I've always used it to treat gas for over the winter storage - and it's worked well. And with the crazy winters here - I often go a couple of weeks without running my truck - no need to and half the time I can't anyway - so it may be helping me there too. In my Verado I burn 91 ethanol free gasoline. I add Mercury Quickleen and Quikcare. Good deal. Ill give it a shot. been using it in my outboards for over 30 years, with NO problems! And that is coming from someone who has his boat stored for around 4-5 months out of the year. Do you mind if I ask where you got it? ahh Thanks for the update!! I know everyone loves this stuff, but if you read the MSDS (Material Safety Data Sheets) on them the contents are alarming. Stabil for instance is 95% deodorized kerosene and Seafoam is 65% isopropanol, which is the most aggressive alcohol available, so that plus E10 is a whole lot of alcohol. Personally, all I have ever done is keep the boat tank and power equipment tanks filled to the brim to avoid condensation and with E10 I have never had a problem in view of the additives the fuel companies use. Every spring everything cranks right up. A least it has for the last 18 years and the boat is stored outdoors. Which is not alcohol - it's another byproduct of oil refining. Gas, Diesel, Kerosene, Asphalt ...they're all from oil.